Group restarts Honor Flights to honor Korean War veterans by taking them to see D.C. war memorials. 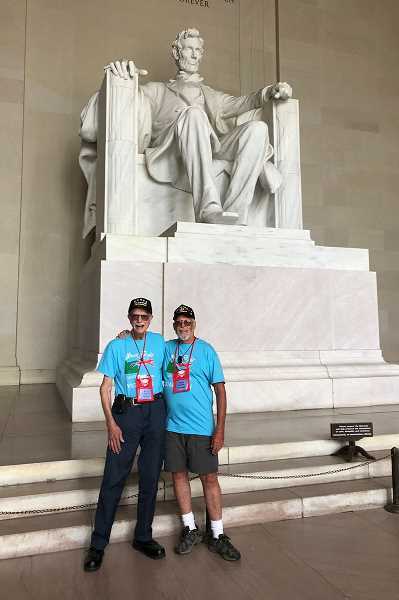 Four local Korean War veterans got to tour war memorials, June 6-10, as part of a free Honor Flight to Washington, D.C.
Madras veterans Bill Apgar, Larry Rose, Jack Donnelly, and Crooked River Ranch veteran Al McKenzie were among the honored guests on the flight. After the Honor Flights for World War II veterans ended, people wanting to continue the trips for Korean veterans formed Honor Flight of Central Oregon, and did fundraising to make the excursion free to the veterans. 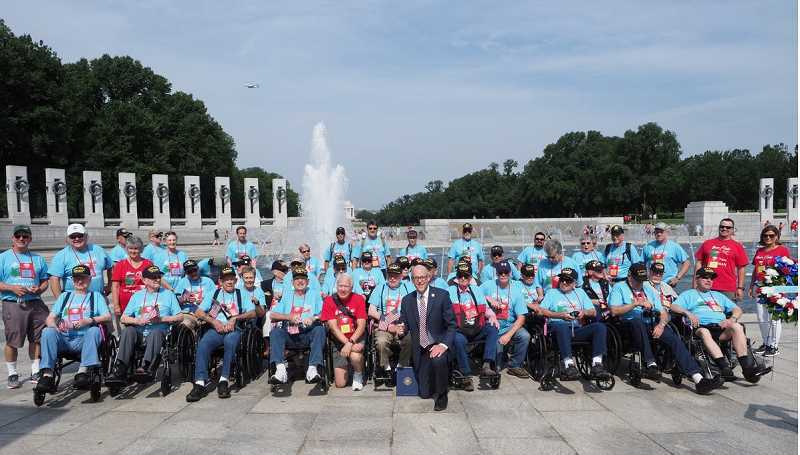 The June trip included 23 Korean and two World War II veterans, was led by Dane Prevatt and Deanna Lynn Neilsen, of Honor Flight of Central Oregon, and included a doctor a medical assistant, and an official photographer. Since most vets are in their 80s, each was accompanied by a "guardian," or helper, to assist them and push their wheelchair during the tours. Although some could walk, wheelchairs were used because of the long distances at airports and memorials. The guardians paid their own way. Madras guardians included Fred Beebe, a Vietnam veteran himself, who helped Apgar, and Pat Neff, who accompanied her brother, Jack Donnelly; and Joan McKenzie, of Crooked River Ranch, who accompanied her husband, Al. Bill Apgar, 85, was an aircraft instrument technician in Korea, working with the 369th fighter interceptor 82nd fighter bomber squadrons from 1953-54. He said Beebee drove the Madras area veterans to Portland in a van, where they stayed overnight, then caught the early morning Honor Flight, with all 25 veterans and guardians aboard a Southwest Airlines jet. After arriving, they stayed at the Holiday Inn in Old Town Alexandria, Virginia, traveled by chartered bus, and enjoyed dinners at nice restaurants. On the first day of sightseeing, Apgar said, "We saw the Washington Monument, Lincoln Memorial, Vietnam and Korean War, and World War II monuments. We met Rep. Greg Walden and had pictures taken individually with him, then got a guided tour of the U.S. Capitol by his staff people." "I appreciated Walden meeting us and visiting with us. I might not agree with his politics, but he's a nice guy," Apgar said. The next day, he said they broke up into four smaller groups with a leader for each. "One lady leading our group had been a Marine and served as a soldier at the Tomb of the Unknown Soldier. We visited there, and got to see the changing of the guards, which was all class A, really special. We also saw Arlington Cemetery," Apgar said. Other stops included the Franklin Delano Roosevelt Memorial, the Navy, Air Force and Iwo Jima memorials, and the Women in Military Service for America Museum. As they toured, Apgar said, "A few tourists came up and talked to us. We were given flags to stick in our packs to hand out to kids we saw." His favorite sights were the Korean War Memorial, the military women's museum, going through the Capitol building, and the FDR Memorial, which also had history on Eleanor Roosevelt. "I was growing up then and remember Roosevelt's time as president," Apgar said. "Everybody was very nice. At the airport terminals, people were lined up and clapping for us, especially the Portland Airport when we came back. I had a Portland deputy take over my wheelchair and push me through the crowd," he said. "I really appreciate Deanna (Neilsen). She was the one who got this up and running again, and they did the fundraising," Apgar added, of the Honor Flights. His guardian Fred Beebee said the trip, "Was a touching experience. We went into a big nice restaurant and I heard all this noise, then saw it was people spontaneously standing up and clapping for the veterans." Al McKenzie, 89, served in Korea from 1951-53. His favorite parts were, "Getting to see the administrative buildings, the U.S. Capitol, Arlington Cemetery, and where the airplane hit the Pentagon (from the bus window). It was quite a trip." Larry Rose, 86, appreciated the people he met during the trip. "My guardian was a young lady, Taylor, a doctor's intern, who was wonderful company. She pushed me in a wheelchair at the attractions. At one place, there were a bunch of walkers and bicyclists, and a jogger came along and came up and gave me the biggest darn hug I ever had in my life!" he laughed. "That was one of the best parts of my trip. I got a kick out of that." "When we got back to the Portland Airport, there was a welcoming group with a Scotsman all dressed up in a kilt with a bagpipe, and (Multnomah County) officers to greet us and lead the group through," Rose said. Pat Neff, went with her brother Jack Donnelly, 85. She said his favorite part was visiting the Korean War Memorial where soldier statues were realistically depicted, wearing rain ponchos and walking through a rice paddy field. "It was very touching, very humbling to go with all those veterans," Neff said.